I love the book of John and today as I was reading Chapter 20 and I became so grateful! I am grateful because these verses help me to understand that even when I am going through something that is totally gut wrenching hard, something I don’t understand, something I frankly just don’t like, God will still be there to comfort me and let me know everything is going to be alright. Think about the story for a minute…In fact, it would help if you read it before we continue. The disciples have walked with Jesus personally. They have ate with him, traveled with him, gone to church with him, prayed with him, and simply spent time with him. And even though there were told this day would come, when the moment happened, and He was…GONE, the emotions were there. It was a loss. They were mourning. They were sad. They had lost their best friend, the one they trusted, the one they counted on, the one they had given up jobs and family for. It was hard to understand or even comprehend. It was gut wrenching, and painful. Then Sunday evening happens. Jesus shows up where the disciples are…all of them but Thomas. He spoke with them, they were filled with joy, He commissioned them and then breathed the Holy Spirit on them. It was truly a miraculous, remarkable, amazing moment in their lives and in history…and Thomas missed it! Have you ever been there? You are frustrated, hurt, sad, going through stupid stuff and your friends are telling you they just had an amazing encounter with God. You’re like “Really God?!?!? !” Don’t you know that I need to see you? I need to feel you! Why, why, whine, whine. So, when Thomas hears about this life changing, history altering, experience that his friends had he says he will have to see it believe it. Better yet, he says, I will need to feel it too!! The Bible says that eight days later Jesus does return and this time Thomas is there. Jesus spoke directly to Thomas and then said I want you to feel me too! Did you get that? Jesus took the time to return just so He could let Thomas see and feel for himself! He cares that much for us, even when we don’t feel like we are ‘leading the pack’ in our spiritual walk! Most people preach this story from a negative perspective of “Doubting Thomas”. And yes, he was doubting but please let’s be honest. Haven’t we all encountered situations that have caused some doubt to creep in? 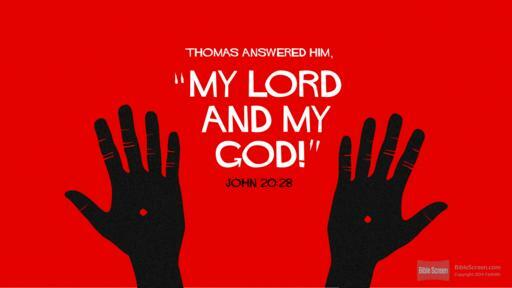 And the wonderful message here is that Jesus was willing to reach out to Thomas even in the midst of his unbelief. He was willing to give Thomas an opportunity to hear Him, see Him and touch Him. I believe it forever changed Thomas simply because of his response in vs28 “My Lord and my God!” Thomas exclaimed!” In that moment He was not just the Jesus that Thomas ate fish with or the Jesus he heard tell great parables. In that moment, Jesus became HIS Lord and HIS God. It was all very personal. So, no matter where you find yourself today I hope that, like me, you will find yourself grateful because sometimes in the midst of our hardest struggles and our deepest doubts God will show up in a very personal way and we, like Thomas, can then say, “He is My Lord and My God!”.